If there’s ever an award for the renaissance man of the audio industry, Daking Audio’s founder and owner, Geoff Daking, is going to be in the frame. He played drums in the 1960s with a platinum-selling US band, became a renowned recording engineer in the 1970s, and a successful studio owner in the 1980s and ‘90s. And in 1993 (as if he weren’t busy enough), Daking started manufacturing his own line of recording equipment. The first product was a discrete, Class-A mic preamp/EQ, based (at the suggestion of the brand’s then US distributor) on a Trident A-Range channel. This was followed a year later by a FET compressor. Fast-forward 25 years and (in addition to the updated Class-A, discrete transistor console, released in 2000) Daking’s US-built product line consists not only of updated versions of that original mic pre/EQ and FET compressor, but also a four-channel mic preamp, the Mic Pre IV, and a single-channel mic preamp, the Mic Pre One. The latest addition to the stable, the twin-channel Mic Pre II shares the component DNA of all Daking Audio microphone preamps — there’s a Jensen input transformer, Class-A operation and a three-transistor discrete amplifier inspired by the Trident A-Range mic preamp. The Mic Pre II circuitry sits inside a side-vented shiny steel 1U chassis, with a rear-printed, white-on-green perspex fascia. On each channel, two large knurled metal knobs set the Gain (26-70 dB) and the corner frequency of a 12dB/octave high-pass filter (HPF) that’s continuously variable 10 and 200 Hz. The channels’ 20-segment green-yellow-red LED meters incorporate a PPM (Peak Program Meter), displaying the absolute value of the highest voltage in the signal, alongside a true dBu meter with 300ms averaging ballistics. The -17 to +23 meter is calibrated with 0 at 0dBu (-4VU or, for professional digital recorders, -18dBFS). Twelve of the 20 meter LEDs cover the range from 0 to +22 dB, with 0dBFS being marked at the +18 point by the first red LED. An asterisked 13th LED at the top of the scale indicates that +23dB has been reached or exceeded. The channels each feature a quarter-inch TS instrument DI input, which bypasses the microphone input’s transformer and -20dB pad. This input is activated by an illuminated-when-active button that sits alongside those for phase (polarity), -20dB pad and 48V phantom power. The actual switching is carried out by internal relays. The line outputs are helpfully presented on both XLR and TRS connectors.The Mic Pre II’s rear panel carries only the XLR connectors for the transformer-balanced microphone inputs and electronically balanced line outputs, parallel quarter-inch TRS jack line outputs and the six-pin DIN connector for the unit’s external power supply. Removing the Mic Pre II’s top panel reveals beautifully built, well laid-out, and relatively sparsely populated printed circuit boards. Component and construction quality is of a very high standard, with each channel’s individual internal power supplies, switching relays and JT-110K-HPC 1:8 step-up microphone input transformers being the most notable features. These Jensen transformers are reassuringly expensive items, offering a bandwidth with -3dB points at 1Hz and 100kHz, a high common-mode rejection (115dB at 60Hz) and 18dB of voltage gain. 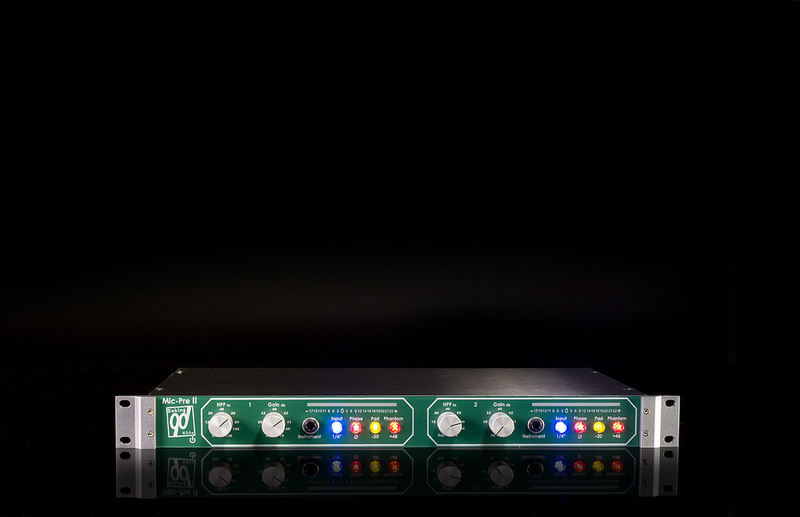 As with many modern rackmount units with external power supplies, the Mic Pre II has no on/off switch, merely a tiny, dimly lit star that acts as a punctuation mark in the unit’s front-panel Daking logo to indicate that power is present. At switch-on, the multi-colour meter LEDs sweep across their full ranges several times in their own little light show to indicate that all is well. The aforementioned HPF first featured in the Daking Mic Pre One, and was introduced to help home recordists working with digital recorders avoid recording environmentally induced low-frequency sonic energy. But as well as helping to eliminate traffic rumbles, footsteps and the like, this filter can also be used to tailor the low-end response of sources that either don’t possess extended low frequencies, or whose bass response needs more precise filtering than that delivered by a simple switchable one- or two-frequency HPF. In use, the Mic Pre II is an intuitive delight — simply adjust the HPF corner frequency and gain level until you hear the sound you’re aiming for, and that’s it. The continuously variable HPF is my favourite feature, as I routinely high-pass every input in both recording and live-sound environments; to me, a physical hardware knob is a much quicker and more intuitive facility than an on-screen icon in a DAW or digital mixer. At lower gain settings and microphone output levels the Mic Pre II sounds clean, articulate, precise and essentially neutral, with a feeling of low-end weight and an overall sense of a slightly sweet smoothness that I find very appealing. When driven harder, the sound seems to become weightier, more forward and more authoritative, which, to my ears, makes any source being recorded through it — vocal, instrumental or percussive — seem somehow more ‘present’ and ‘in focus’. With the Mic Pre II’s excellent transient response and its available headroom, you may well need to take care to avoid clipping the inputs of the next stage in your recording chain, particularly if you’re pushing the gain levels. The test trace that accompanied the Mic Pre II showed a frequency response that was virtually ruler-flat from 50Hz to 20kHz, and that fell smoothly away to be only 0.3dB down at 20Hz, so any audible tonal anomalies in its output are probably going to come from the source, and not from the unit itself. Although there are a number of similarly priced, good-sounding, vintage-inspired two-channel mic preamps, but other than the Phaedrus Audio Hydra (see the Alternatives box), I’m not aware of any that take their inspiration from the venerable Trident A-Range console, and that in itself makes the Daking Mic Pre II more than worthy of an audition, especially if you’re seeking a mic preamp that doesn’t sound quite like anything else. As I’ve said before, I have a very soft spot for audio gear that has come about as the result of a developer’s genuine passion, and the Daking Mic Pre II very definitely ticks that box — and it offers a high level of performance for a very reasonable asking price too. At similar price points there are the Warm Audio WA273 and the SPL Goldmike Mk2. Focusrite’s ISA 2 offers another transformer-balanced alternative. A pair of Phaedrus Audio’s Hydra would also be well worth considering — they'd offer the Trident sound (among others) for a broadly similar price, though you might also want to budget for the rack adaptor and the mains PSU to replace the bundled wall-warts. If you have a somewhat higher budget in mind, you might also want to consider something like the DACS Clarity MicAmp 2 or Miktek’s MPA-201, or even the Trident A-Range dual channel-strip, comprising two channels of mic preaplification and EQ (though this was listed by the manufacturer as 'out of stock' at the time of writing). High level of audio performance. True dBu metering with averaging ballistics, plus PPM. Very attractively priced, given the performance that it delivers. Users who habitually push the Mic Pre II to its limits might miss an output level control. Based around the legendary Trident A-Range console microphone preamp and its three-transistor amplifier stages, the Daking Mic Pre II offers a distinctive alternative to the sound of other vintage-style mic preamps that take their inspiration from a rather more common source. Trans Audio Group +1 702 365 5155.